Equestria Daily - MLP Stuff! 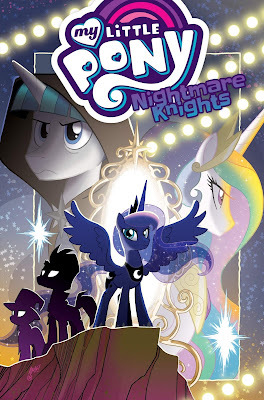 : My Little Pony: Nightmare Knights Trade Paperback Available for Preorder on Amazon! My Little Pony: Nightmare Knights Trade Paperback Available for Preorder on Amazon! Ladies and Gentlemen, the trade paperback collection for My Little Pony: Nightmare Knights has been listed on Amazon.com! Huzzah! The comic starring Princess Luna will soon comfortably fit on my bookshelf! I know we haven't posted the Trade Paperback releases for a little bit on EQD, but I'm bringing this back for one very simple reason. This book has been my all time favorite My Little Pony Comic Series. I want a follow up, and I know I'm not the only one! The best way to show our friends at IDW Publishing just how much we want this book to come back is if we order and order hard on the Trade Paperback. So what do you say, Bronies. Do you want another adventure where Princess Luna saves the day? Powerless and threatened by a great evil, Princess Luna discovers she can't count on her sister or any of the usual heroes of Equestria. Running out of time and with nowhere to turn, Luna assembles a team specially suited to save the day... a team of former villains! Will Luna, Capper, Tempest Shadow, Trixie, and Stygian all be able to work together and find a way into the most dangerous place any of them have ever been? Collects the complete five-issue miniseries.